You might have seen me spamming what I’m spinning on Turntable.fm if you follow me on Twitter (which you should…obviously). 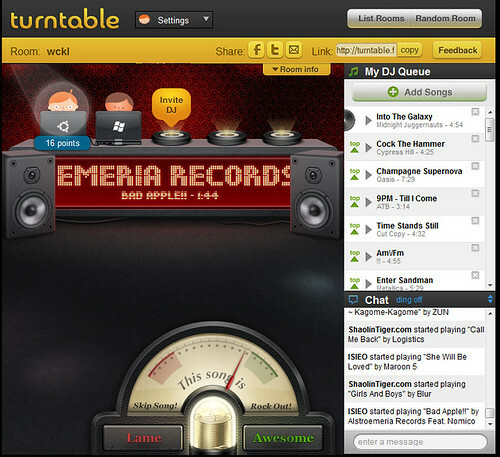 Turntable.fm is basically a really cool HTML5 application using Canvas – it’s very simply but very addictive too. There’s 5 DJ spots and you can play anything you want, it’s not limited by what they have in their library (which is epic) – because you can upload stuff yourself. 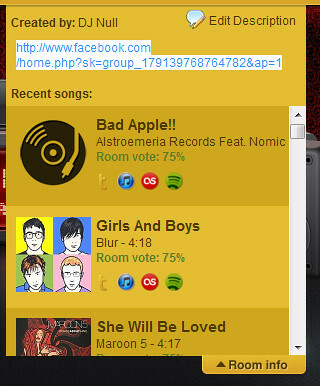 People can vote your track Lame or Awesome – if you click awesome your avatar will start bobbing it’s head. If enough people click Lame the song will be skipped and it’ll move on to the next DJ. It’s extremely tightly integrated with Facebook and uses Facebook auth for access, so you need to have a Facebook friend already using the service to get in as it’s still in BETA. I’d imagine it will be a chargeable subscription service when it launches properly as they must be using HUGE amounts of bandwidth. There are some cool features like a list of songs that have been played, including ratings and artwork. The cool part is too, it’s integrated with iTunes and Spotify so you can directly buy the songs you like. It has a chat box kinda thing too and you can share what is being played on Twitter, E-mail or Facebook. It’s most active during work hours when everyone is hacking away in the office and needs some funky tunes, you can just hang out in the audience if you want to enjoy what we are playing or jump and DJ if there’s a free spot (there’s a limit of 5 DJ’s though and it’s quite often full during peak hours). Be careful though, it’s addictive! Cars Cars Cars! & The Perodua Auditions.